It's a short game created for Ludum Dare 42. 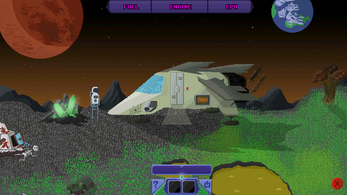 Blaze, a space explorer, is attacked by space pirates. He crashed upon an unknown planet and needs to fix his ship in order to escape from there safely. - There is a bug when trying to delete some items. Sometimes the game deletes the wrong item from inventory. Thanks for playing another game of mine! :) Well it isn't actually just mine, we worked as a team on this one with my mate Alan. I'm happy that you enjoyed it. If you want, you can try out "Haven - The Small World". It's from last year's jam ;) It's on my page.